How about Amir Khan Vs Carson Jones? Would you be happy if this fight happened later in the year? Their has been a lot of debate on who Amir Khan should fight next, I myself suggested Breidis Prescott, not many of you agreed with that idea, but what are your thoughts on this fight - Amir Khan's first fight in the Welterweight division against Carson Jones? Jones gave Kell Brook an extremely tough fight, it would be interesting to see if Khan does better against Jones, compared to his British rival, Kell Brook. Not only that, but Jones is a top ten Welterweight, a win over Jones would earn Khan a world title fight. Also with the styles of Khan and Jones, the fight would guarantee excitement. I would take Carson Jones by knock-out. In my opinion, Jones has the style to cause Khan nightmares. Jones has a tight defence, puts a lot of pressure on you, and fights well on the inside. Khan would have a problem landing his little flurries on Jones, Khan can't handle pressure (Maidana and Peterson fights) and Khan can't fight on the inside. If Khan doesn't either stop, or do a lot of damage to Jones in the early rounds, I don't see how he wins this fight. I think Jones would get a late round stoppage. After that I would love to see a rematch between Carson Jones and Kell Brook. That's my prediction for this fight, I don't think the fight will get made because Golden Boy will probably view Jones as a high risk/low reward type of opponent. 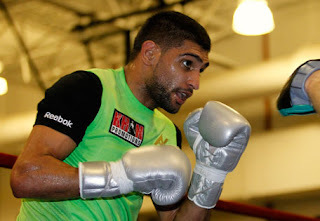 As a fan, I would love to see Khan fight either Breidis Prescott or Carson Jones next, but I imagine Golden Boy will get Khan a fight against a light puncher. Who do you want to see Amir Khan fight next? How would a Khan/Jones fight go?